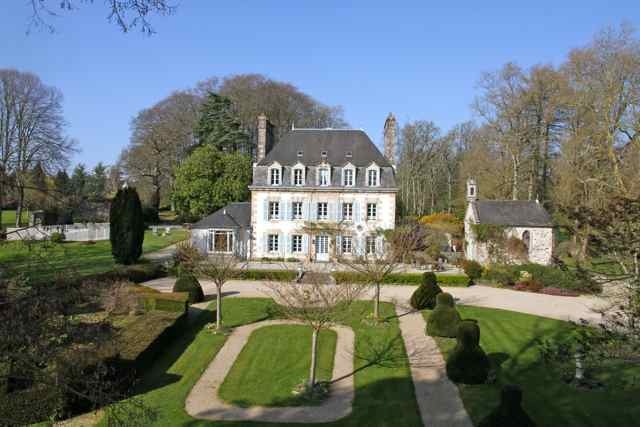 COAT AMOUR is a delightful early 19th century manor house, set in 12 acres of beautiful parkland, close to the centre of the medieval coastal town of Morlaix. Within the manor house we offer, for bed and breakfast, five large and quite different bedrooms, each with its own bathroom or shower room. We also have family suites that will appeal to families with children. Evening meals are available by prior arrangement. There is free WIFI access within the main house. Two beautiful secluded and private gites in the grounds provide self catering holidays, one for seven and the other for two/three persons. With its own securely fenced swimming pool, charming park land and private chapel, Coat Amour provides not only peace and tranquillity, but something for all the family. The current proprietors, Stafford and Jenny Taylor, look forward to sharing their home with you. It is a short walk into the centre of Morlaix with it’s fantastic Saturday market, lovely shops, large choice of restaurants and creperies, and port. Being 20 minutes drive from many lovely beaches, a similar distance from the Mont D’Aree National Park and close to many other local attractions, Coat Amour is an ideal base for a gite or B&B holiday. Our proximity to the ferry terminal at Roscoff, Brest airport, the N12 Express route and TGV terminal in Morlaix ensure short journey times to Coat Amour. English Pirates raid Morlaix, Brittany!